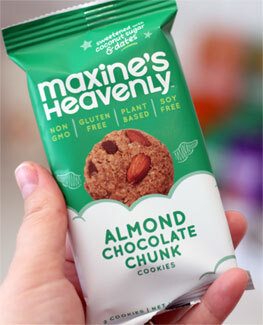 You don't have to sacrifice flavor for health treats when you indulge with Maxine's Heavenly cookies! 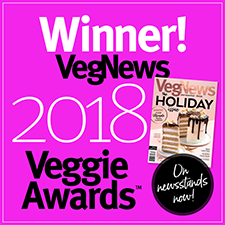 Dessert can be tasty AND good for you, as Maxine's Heavenly has proven with these soft-baked cookies that are made from real, wholesome ingredients and are never short on great taste. 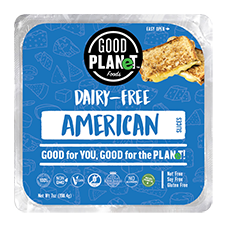 Formulated to be GMO-free, soy-free and gluten-free, they're made with good-for-you ingredients such as gluten-free oats, coconut sugar, dates, flaxseed and oat fiber without anything artificial or unnecessary. You won't feel guilty about catering to your cookie craving with these delicious treats! If you like almonds, then this cookie is for you. We add whole almonds as well as all-natural almond extract to create a brilliant crunch and sophisticated flavor (think marzipan or amaretto). Combine that with chocolate chunks and a soft-baked texture and you’ll know what heaven tastes like. Each 1.8 oz. (51g) package contains 2 individual Almond Chocolate Chunk cookies. $1.99 per package.